Coffee, Oysters, Champagne (COC), Toronto’s first serious champagne lounge, is awesome! 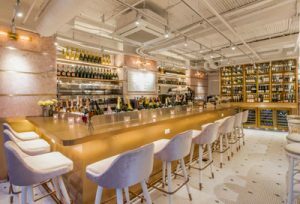 Nevermind that it’s pretty in pink with rose onyx walls, marble and gold tables, and plush velvet banquette booths, it also houses the city’s largest selection of bubbly. Service in the chicly designed front-of-house dining room and bar segues from morning coffee and pastries to champers and delicious bites, including oysters. There’s a distinctive French elegance to the pretty setting, especially upon entering the champagne room filled with bottles of sparkly ready for popping. And, then there’s À Toi – a sultry “hidden” restaurant-lounge just beyond the doors of the champagne room. Opulent in design, the space looks and feels like an upscale speakeasy straight out of 1920s Paris. A fancy hotel lobby vibe prevails with a vintage “check-in” desk. Moody lighting, dark wood, secret dining nooks and velvet booths abound. Staff, even, add to the experience, serving cocktails and impeccably prepared French cuisine with a theatrical flourish. Private event buy out is available with a capacity for 280 people.